The Clayton Government Center is located at 6996 Taywood Road at the southeast corner of Taywood and Old Salem roads. Phone (937) 836-3500. 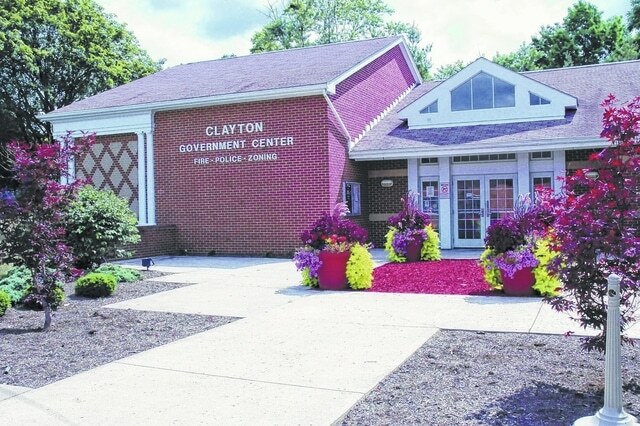 CLAYTON — City Council approved a street resurfacing contract at its June 18 meeting with John R. Jurgensen Company for the 2015 street resurfacing project at a cost not to exceed $208,768. Some of the roads slated for resurfacing include Garber Road between Willowcreek Drive and Westbrook Road, Diamond Mill, Ellis Avenue, several streets that would require full-depth repairs. “We are keeping track of them,” said Public Service Director Randy Sanders. Council also accepted a bid and authorized a contract with Wagner Paving, Inc., to provide chip and seal with half-inch asphalt leveling on Haber Road at a cost not to exceed $55, 253. “This is the one mile stretch of Haber Road that runs from Sweet Potato Ridge Road out to Phillipsburg-Union Road and we are going to chip and seal that road with a half inch leveling course of asphalt underneath of it,” Sanders stated. He pointed out that Clay Township has used the same process on some of its roads and have gotten 10-years of life from that process. The half-inch of asphalt is applied to level out the road and fill potholes and after a week the road surface will be chip and sealed. Council also approved an agreement with Griffin Paving Striping, Inc. for thermoplastic and striping of city streets at a cost not to exceed $16,000. According to Sanders the city has not striped its roads on a regular basis and plans are now in place to have roads restriped on a routine basis. In other road matters, the city authorized the Ohio Department of Transportation to plane and resurface State Route 48, a quarter mile section on the north end of the city near Sweet Potato Ridge Road. The project would not take place until 2018 with the city’s share of the project coming in at $20,000.